Thailand m-commerce: Line enters into online shopping world with aCommerce! Home »m-Commerce»Thailand m-commerce: Line enters into online shopping world with aCommerce! Recently I read a news about Xiaomi selling phones in China. It would have been a usual news if Xiaomi hadn’t sold 150.000 phones within 10 minutes via WeChat. Customers are not required to have credit cards. They can pay via Cash on Delivery. The ordered product will be delivered directly to the customer’s door. This Flash Sale is formed by a partnership among Line Thailand, eCommerce builder aCommerce, and L’ Oreal to boost Thai market. aCommerce is a Thailand based company dedicated to powering online and mobile retail in Southeast Asia. Those not familiar with aCommerce might like to know: aCommerce’s Chairman Paul Srivorakul was the founder of Ensogo, a Groupon clone group operating in Thailand/Indonesia/Philippines, which was sold to Living Social. Paul is also Chairman of ArdentCap, which is focusing on eCommerce startups in SEA. For more information please find the full following press release. Bangkok. December 9, 2013. Maybelline is taking an innovative approach to releasing its newest product line. The product, which the brand is keeping a secret, will be launched for the first time on LINE mobile chat on December 16th. Using Thailand’s most popular chat application that boasts 20 million users, or 25% of the Thai population, the move to mobile commerce is unprecedented for the L’Oreal group brand in Thailand. LINE currently reigns as the #1 chat app in Thailand with 20 million users locally and 300 million users internationally. Maybelline, a prominent brand within the L’Oreal Group is the first innovative brand to join forces with LINE in this mobile commerce partnership. The sale will last from Monday to Friday. The Flash Sale rewards LINE users with exclusivity to a great product, as they will be the first to own this product prior to main market release to public next year. How the mobile commerce Thailand partnership works? It only takes three clicks to purchase the Maybelline Flash Sale and it will be delivered directly to the customer’s door. [quote]Using smart phones to do shopping is making buying make-up easier than ever, especially in time for the holidays. Shoppers no longer have to wait in line or travel to busy stores to get what they want. They can purchase it while riding the MRT to work. [/quote] Thailand aCommerce CEO Tom Srivorakul said. There is no credit card information needed either. How long will the mobile commerce partnership take? For shoppers in Bangkok, the Flash Sale product will be delivered on the same day of the order or the next day, guaranteed. For orders elsewhere in Thailand, shoppers will get their make-up in 2-3 business days. Keep your eyes peeled for the next flash sale to be held by the L’Oreal group right in time for the New Year. Additional offers from various well-known brands will excite LINE members well into the next year. The partnership and execution was conceptualized by regional e-commerce enabler, aCommerce, a Thailand based company dedicated to powering online and mobile retail in Southeast Asia. [quote]Right now, LINE is well known for its popular oversized emoticons, or stickers. In Japan, LINE has successfully pioneered commerce of physical retail through its platform. With the support of an innovative Maybelline team, we contacted LINE who was also looking for a unique opportunity to bring that same retail excitement to their loyal members in Thailand. [/quote] aCommerce Thailand CEO Tom Srivorakul explained. 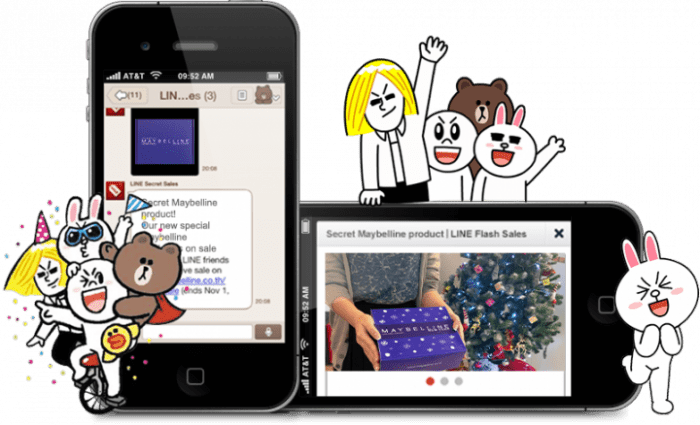 LINE, owned by South Korea’s Naver Corporation, launched in June 2011 with great success in its adoption of the Flash Sales offering in Japan earlier this year. Thailand is the 2nd largest market globally for LINE, with 25% of the Thai population socializing and sharing on its platform. There are 7.2 billion daily messages and over 216 billion stickers sent by Global users from June 10, 2012 to October 31, 2013, according to LINE. E-commerce is growing at a phenomenal rate in Thailand with an increasing percentage of transactions happening via mobile devices. For LINE, the partnership with aCommerce will continue to bring unique offerings to their users. Founded in 2013, aCommerce offers end-to-end e-commerce solutions for brands in Southeast Asia. Brands looking to build their presence online but lack the know-how within the complex SE Asian landscape turn to aCommerce to support everything from e-marketing , e-development, channel management, logistics, and delivery.